Kim Jong Un invites S. Korea's Moon to Pyongyang - Integration Through Media ....! SEOUL, (AFP): North Korean leader Kim Jong Un invited the South’s President Moon Jae-in for a summit in Pyongyang Saturday, Seoul said, even as the US warned against falling for Pyongyang’s Olympic charm offensive. The invitation, delivered by Kim’s visiting sister Kim Yo Jong, said Kim was willing to meet the South’s leader “at the earliest date possible”, said a spokesman for the presidential Blue House. An inter-Korean summit would be the third of its kind, after Kim’s father and predecessor Kim Jong Il met the South’s Kim Dae-jung and Roh Moo-hyun in 2000 and 2007 respectively, both of them in Pyongyang. Moon did not immediately accept the invitation. But the prospect could sow division between the dovish leader, who has long argued for engagement with the nuclear-armed North to bring it to the negotiating table, and US President Donald Trump, who last year traded personal insults and threats of war with Kim. Washington insists that Pyongyang — which is under multiple sets of UN Security Council sanctions — must take concrete steps towards denuclearisation before any negotiations can happen. After months of silence on whether it would even take part in the Pyeongchang Winter Olympics in the South, the Games have driven a rapprochement on the peninsula, while the North’s athletes, performers and delegates have dominated the headlines. Moon met Kim Yo Jong — a close confidante of her brother and the first member of the dynasty to set foot in the South since the Korean War — and the North’s ceremonial head of state Kim Yong Nam at the Blue House in Seoul. “We hope to see you in Pyongyang at an early date,” Kim Yo Jong told Moon after delivering a personal letter from her brother, according to officials. “We want to see President Moon become a protagonist in opening a new chapter for reunification and leave great footprints in history,” she said. The two Koreas have been divided since the conflict ended in a ceasefire in 1953, and the democratic South has risen to become the world’s 11th-largest economy, while the North has stagnated under the Kim family’s rule. The offer could put Moon in a delicate diplomatic quandary, but he avoided a direct response, said his spokesman Kim Eui-kyeom, and called instead for efforts to “create the right conditions” for a visit. Moon urged Pyongyang to actively seek an “absolutely necessary” dialogue with Washington, he said. Tensions between the two soared last year as Pyongyang launched intercontinental ballistic missiles capable of reaching the US mainland and carried out by far its most powerful nuclear test to date. Analysts believe the Olympic diplomatic drive by the North — which put its ICBMs on show at a military parade in Pyongyang on Thursday — seeks to loosen the sanctions against it and undermine the alliance between Seoul and Washington. 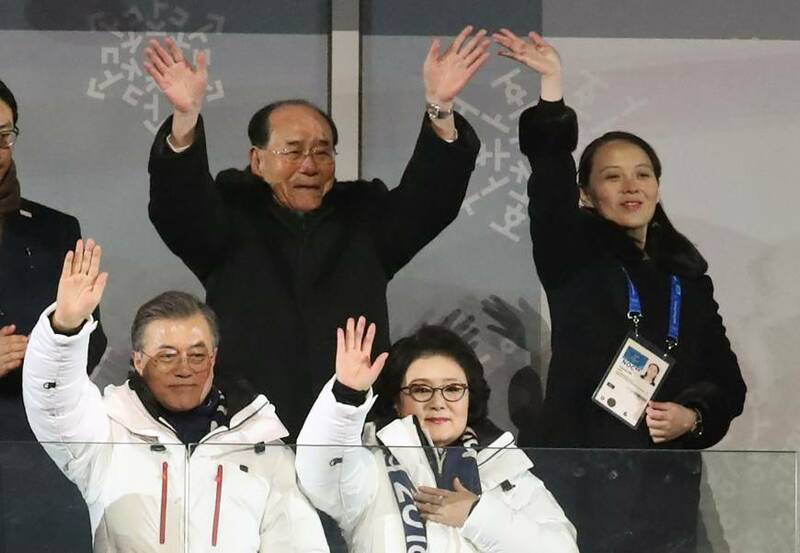 Moon shook hands with both Kim Yo Jong and Kim Yong Nam at the Olympics opening ceremony on Friday and they cheered as athletes from North and South entered the arena together behind a unification flag showing an undivided Korean peninsula. All three were reportedly due to watch the Koreas’ unified women’s ice hockey team’s first match against Switzerland later Saturday. But US Vice President Mike Pence, who was seated in the same box at the opening ceremony, did not interact with the North Koreans at any point, US officials said. He did not shake hands with Kim Yong Nam while making a brief appearance at a leaders’ reception ahead of the ceremony — although Japanese Prime Minister Shinzo Abe did so. In stark contrast, two kinds of kimchi — the fermented cabbage that features in every Korean meal — were on the menu for the delegation’s lunch with Moon at the Blue House on Saturday, one mild Northern style version and a spicier Southern recipe, along with soju, the traditional Korean rice liquor. The smiles and handshakes were friendlier than some of the North’s past history with the complex — in 1968 Pyongyang sent commandos to attack it to try to assassinate the South’s then leader.